This is the stuff that you don’t really have to put on the go kart, but you may think about. I have addressed the optional fabrication points here with their pros and cons. Don’t want optional fluff? Scroll down to the recommended section. A go kart safety flag would be nice to install on the back of the kart. The flags that I have seen on some karts just bolt through a hole. You would weld on a tab on the back of the kart and bolt the flag onto it. The size of the hole would depend on which flag you get. Here is an Amazon link to a go kart flag list so you can see what I am talking about. The kart is built low to the ground, and can be dangerous if you put someone inexperienced behind the wheel. Naturally, one of the first things you think of is safety, and you may think is ‘Can I put seat belts on my go kart?’ which may or may not be a good idea. Seat belts on go karts can be a double edged sword. Yes, a lap band go kart seat belt can be installed. You go about doing this by welding three 1/2″ or 3/8″ flat washers on the kart behind the seat, buying some go kart lap bands, and bolting them through the washers. go kart seat belt pros: the feeling of safety, keeps you stuck on the kart. My take on the matter is if you want to get seat belts, make sure you make your own roll cage, otherwise, just drive smart and wear a helmet. Please drive safely, and always wear a proper full helmet. The kart has a limited speed, and wide base. It is unlikely that you will flip. Driver and passenger safety rests on whoever is driving the kart. Don’t yank the wheel at full speed, or drive it into the curb or a tree. Practice slowly at first until you get a good feel for the kart. Installing headlights on the kart looks cool, but is optional. If you need more visibility, a headlight would help you be seen in the day and night. I did not put a light on the kart because I planned on driving it in the daytime. 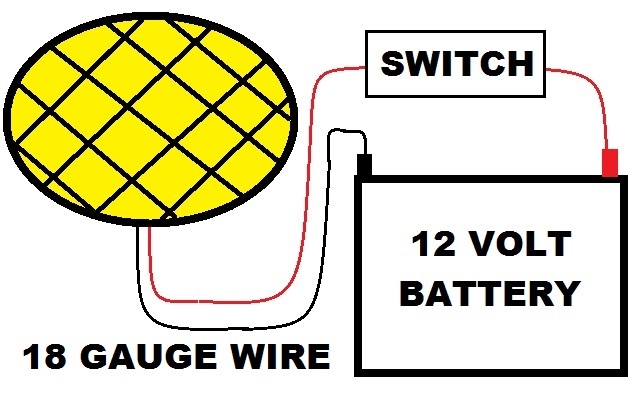 Here is a go kart light wiring diagram to show you what hooking up go kart lights entails. Weld a mounting bracket for the light. 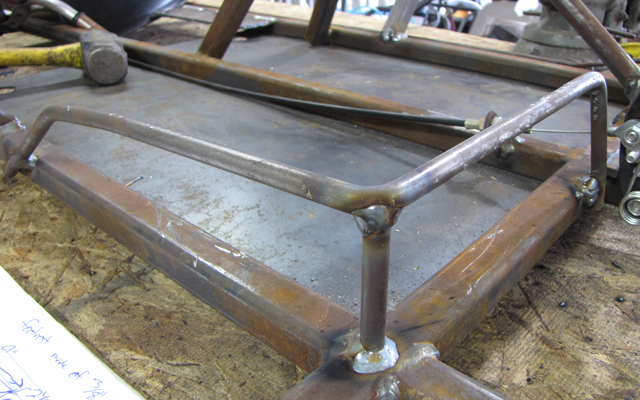 You can use the extra 3/16″ steel plate and weld it to the steering hoop top. The light will bolt through this tab. Go kart lights typically have a bracket supplied with them so you can adjust left and right, up and down. Install a light switch. Drill a hole next to the kill switch for the light on/off switch. The light switch can be any old on/off switch that you can find at a hardware store and typically has two terminals. Weld the battery holder. You can simply weld a rectangle with angle iron, then use some threaded rod and nuts to bolt the battery on top of this battery mount. I recommend putting in side rails, and a footrest to help keep the driver and passenger safe. 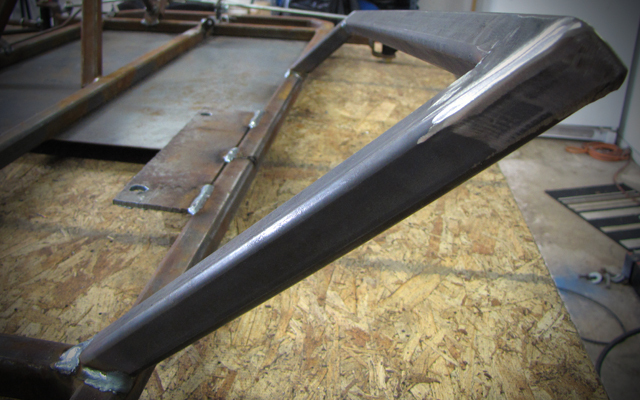 The side rail help keep you from sliding off the side of the kart, and the footrest keeps you from sliding off the front or into the tie rods. Check out the free go kart plans for dimensions and materials. 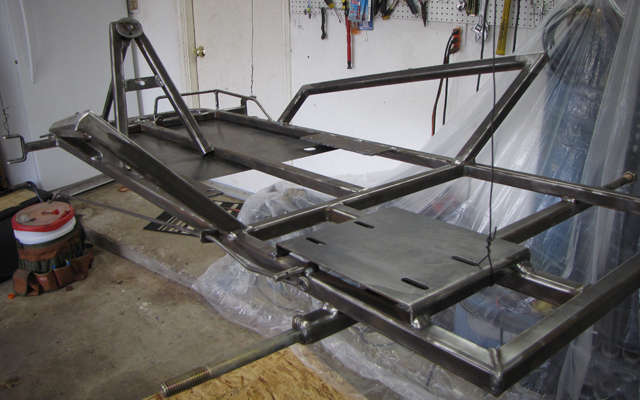 Now that we have gone over the final fabrication points, the frame is ready to be prepped and painted. You suggested using a piece of the 3/16″ to help get them angled right because they don’t come with any kind of cut-out at the bottom. What about grinding them down or cutting them to about a 45 degree angle and then welding them to the top of the frame? Would that work? How do I find out the size of my shaft on my engine? Thanks. Reviewing the videos again helped. Not sure why I had to stare at it so long for it to sink in. We got the seat on tonight and the kids have been driving it and having a blast. We’ll get the rails on Wednesday. Thanks for the great plans and site. I know this takes a lot of time. Much appreciated. This was a good warm up for the cycle kart I plan to build this winter. Great plans. My kids and I have almost completed the build. I have a question about the side rails. Can you post a picture of a straight side view of the cart so I can better see the angles for the side rails? It would be a nice addition to the plans to have a flat view of the rails before they are mounted to the kart. I believe only perspective views are used in the plans and on your site and it makes it hard to see the angles.